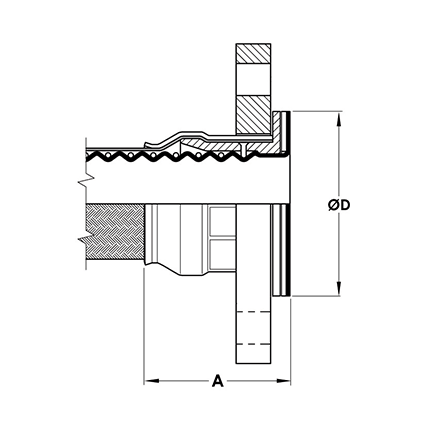 *The dimensions for flanges to the different pressure ratings are identified, so they are inter-changeable. 90˚ Elbow Integral PTFE lined Flange Fittings are available for 1”, 11/2” & 2”. It may be necessary to fit a larger than nominal flange size to the hose - for example, 3” flange fitted to one end of a 2” hose - in which case it may also be necessary to increase the diameter of the sealing face to the correct size for the larger flange. 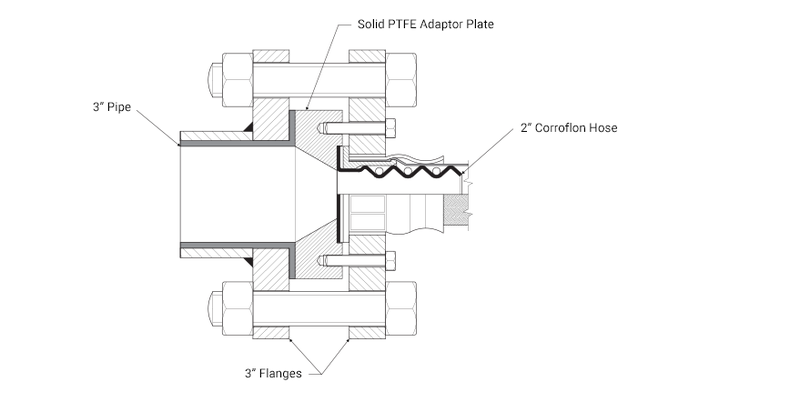 This can be achieved by means of a flange adaptor as shown. Within limits, it is also possible to make up an assembly with a flange one size smaller than the nominal size. The smaller flange is bored out and fitted to the larger hose and, if necessary, the flared diameter is reduced to suit. Consult the supplier if a different flange size is required.